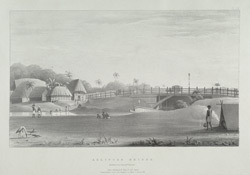 This lithograph is taken from plate 28 from William Wood's 'Views of Calcutta'. Published in 1833, this was the first series on Calcutta produced by the lithographic process rather than engraving or aquatinting. Wood had lived in Calcutta from 1828, assisting his brother George with the Asiatic Lithographic Press. This is a view of the southern part of the city. Kidderpore, Alipore and Bhowanipore are the three suburbs seen from west to east on the other side of Calcutta's great Maidan (or green space) and separated from it by Tolly's Nullah. Both Alipore and Kidderpore bridges crossed the nullah. This watercourse was named after Colonel Tolly, who dredged it out of the dried-up bed of the Kidderpore Creek, making a link with the delta east of the River Hooghli.